If there was a 17-point half-court shot in weather ball, Buffalo nailed it last Friday. The lake-effect snowstorm that buried the city Friday under 17.2 inches of snow also vaulted it from third place on the nation's list of snowiest U.S. cities into the top slot, according to GoldenSnowGlobe.com. Early last week, Buffalo trailed first-place Syracuse by nearly 16 inches and Rochester by 9 inches before Friday's storm. The city also went from a nearly 7-inch seasonal snowfall deficit to a 10-inch surplus in a single day. 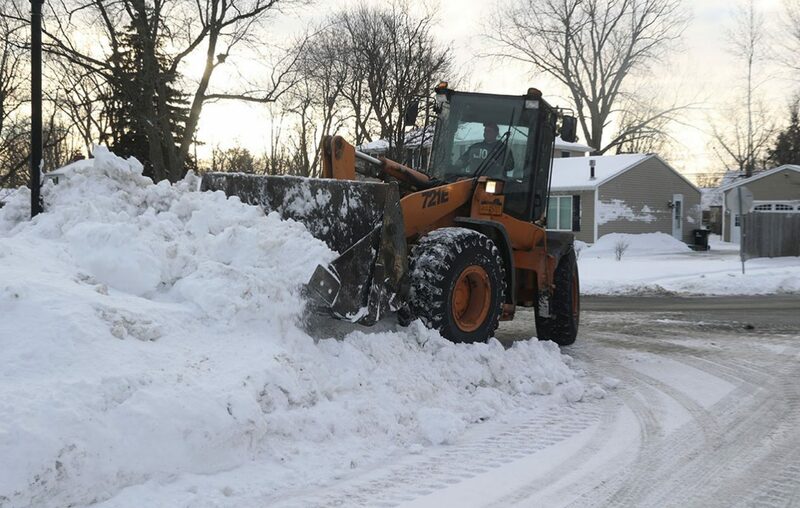 Not only does the 42.2 inches of January snowfall so far account for more than 60 percent of the city's seasonal snowfall, it ties January 2014 for the city's snowiest January this decade. It's the second-snowiest behind January 2004's 45.2 inches for this century to date. Buffalo will shoot past both of those years this week and has a good chance to build on its roughly 3-inch lead over Syracuse before the month goes into the history books at midnight Thursday. 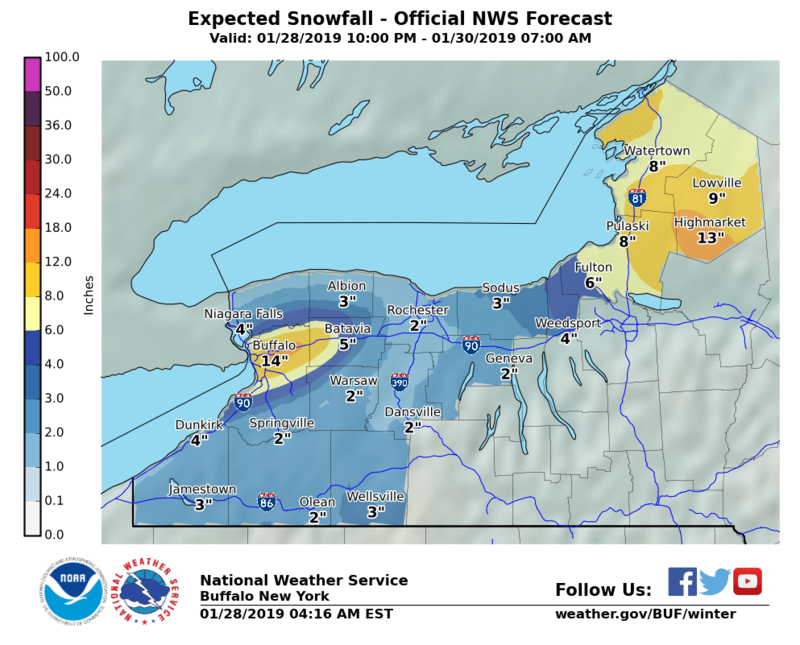 The National Weather Service forecasts show that more than a foot of snow is possible in metro Buffalo by early Wednesday – and up to 2 feet is possible – with an incoming blast from the polar vortex. The frigid air is expected to cross the still relatively warm, open waters of Lake Erie from the southwest. That's just the right flow to steer heavy lake-effect snow into metro Buffalo. 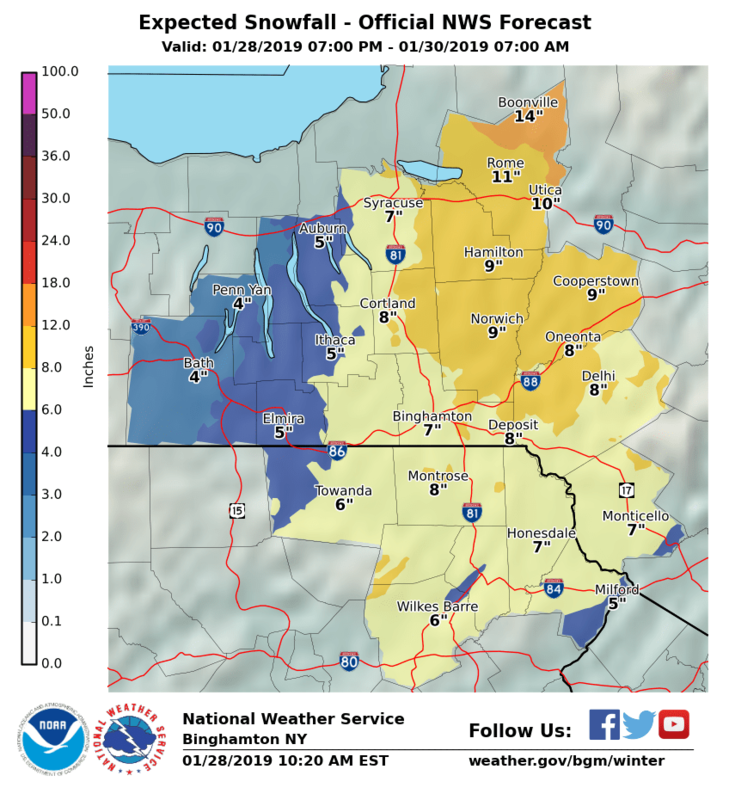 Forecasts show about 7 inches are expected in Syracuse through Wednesday morning.